Japanese-Inspired Shredded Beef Tacos. This post was sponsored by Ling Ling, all opinions expressed in my post are my own. If you haven’t noticed already, I’m a little enamored with Ling Ling Fried Rice. I’ve used it in a squash recipe, appetizer bites and now these Japanese-inspired shredded beef tacos and I can’t decide which recipe I like the best. Ling Ling Fried Rice makes staying in taste like going out! I’ve mentioned it before but it’s worth repeating that Ling Ling uses an Infusion cooking method that ensures every grain of fried rice is infused with exceptionally flavorful signature sauces, and it’s nearly impossible to tell the difference between Ling Ling Fried Rice and your restaurant favorites. I just can’t get enough of it, and since a single pouch of frozen fried rice is heated and ready in just four minutes in the microwave (there are two pouches per box), it’s ridiculously easy to use as part of a tasty meal the whole family will love. 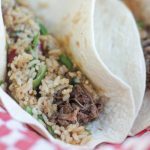 The Asian style fried rice varieties are inspired by authentic recipes from Japan, China, Korea and Thailand, and I used the Yakiniku Beef for my Japanese-inspired shredded beef tacos. The nice thing about this recipe is that the beef and seasonings can just cook all day long in the slow cooker. When it’s time for dinner, shred the beef, prepare the Ling Ling Fried Rice, and serve in warm tortillas. It’s an easy and delicious meal! Add meat, onion, garlic, ginger, beef stock, soy sauce, mirin, sake, rice vinegar, pepper and salt to slow cooker. Cook on low heat 8-10 hours. Move beef to separate bowl and shred with forks. Add 1 cup of the broth to moisten slightly. Microwave Ling Ling Fried Rice according to package directions. Spoon meat and fried rice into warm tortilla shells. Top with your favorite complementary Asian sauce as desired e.g. Terikayi sauce or Ponzu. Enter to win one of 10 $100 Walmart Gift Cards! I love tacos! This recipe puts a new spin on tacos and I can’t wait to try it. This is something my entire family would love and it isn’t too difficult to make. Chuck roast is on sale at Publix this week, and I just found the perfect recipe for it! I make tacos for my family all the time, but we have never had Japanese inspired tacos. This looks so good. Ling Ling Yakiniku Beef Fried Rice looks amazing too and easy to prepare. Yummy, my family will love this one. I love fusion recipes that combine all the flavors I love. This recipe wins bonus points for also including my BFF, the slow cooker. Can’t wait for our next Taco Tuesday. Yummy! These beef tacos look great! I will be making these after I am pooped from all the holiday cooking! I honestly love any taco variation but I especially love trying new tacos. This dish has some delicious flavor combinations. Oh yum! I love fried rice but haven’t tried the Ling Ling brand before. These shredded beef tacos are making my mouth water!! Love tacos, would love to give this recipe a vegetarian twist though. Maybe use potatoes in place of the beef. I am sure it is going to come out well. My daughter would love this! She love taco and Asian food so this idea is a perfect one for her. Now we were talking that Taco looks so delicious. I am Asian and tacos is my favorite so this is perfect for me! Oooooo can we say yum?!?!! I just love Asian food!!! Ling Ling rice is pretty delicious, so I will be trying these tacos! Today is Taco Tuesday in our house so I’m thrilled that I came across this recipe. It is always great to put a new spin on a traditional dish like tacos. That sounds delicious, I think I am going to go take out some pork and make the same dish! We love tacos, eat them at least once a week. Oh I am here for the fusion tacos! I am going to Japan in Feburary so I would love to eat this to get me in the spirit. Seriously? My belly is whining for this now and it’s only 7am! Thankfully, it’s easy. C’mon dinner time! I can’t resist tacos and these look delicious! I love Japanese food, especially when it is this easy to make! I cannot wait to give this recipe a try! What an interesting twist on tacos and perfect for something different for family taco night. This looks amazingly delicious! I am sure my family will love this for dinner any night of the week! What a fun dish! I love that it’s a quick and easy one and kid friendly. I know my kids would eat this up. This looks delicious! I would love to try this for dinner tonight! These tacos sound SO good! This is going on my “to try list” soon. Yum … what a fun twist on regular tacos! Love the Asian influence. This looks amazing. I need to pick this product up so that I can make these. I bet they’re going to be so good. This beef looks so good! I love how moist and flavorful it is! I bet it would be even better the next day too! Oh I wish I was making these tonight. These look really good right now. This looks like such an amazing recipe! Yum! Thanks for the coupon! I will have to try this out for dinner this week. What a great giveaway too! Now that’s a great idea for a taco! I’ve put rice in some random dishes but never my tacos. I looove putting rice in my tacos. Not only is it a great filler, the texture is just perfect. This is a really great recipe. I love beef tacos. I am always looking for new recipes to try. I will have to look for some Ling Ling Yakiniku Beef Fried Rice. I would love to make this recipe on the weekend. I am sure it will be a big hit. I have never put rice right into my tacos. What a fun idea and I bet it adds texture and taste! I would love to make this for me and my husband! I’m sure he’s going to love this one. It’s definitely something we’ll both enjoy and the cooking is easier because of Ling Ling fried rice! I need to give this a try! Especially since my boys are so into tacos these days! We also eat a lot of rice so this one’s just perfect. Thanks for the recipe! This dish is so up my ally! I love shredded beef tacos and love that you added a Japanese twist! I love any kind of taco. This Japanese inspired version sounds like a fun twist on a classic. Oh holy yum! you had me at tacos. I love love love japanese food and tacos so this sounds right up my alley! I’ve just recently stated making fried rice, with an Indian spin on it! I need to try adding rice to tacos, sounds so good. I’ve never tried adding rice to my tacos before! That’s really awesome. I’d love to give this a try the next time we have tacos at home! Thanks for the recipe! I agree. 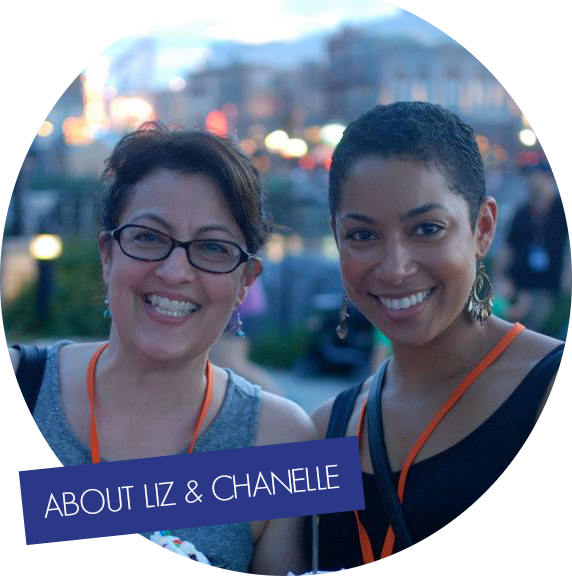 This is a really fun spin on the traditional taco Tuesday! I have really been wanting to try this rice! It sounds delicious! This recipe sounds like something my family would love! I don’t remember the last time I had tacos but how delicious do these sound! I definitely need to try and give these a try sometime soon! Oh YUM! These sound perfect for Taco Tuesday tomorrow. My kids will LOVE them. I was just talking to my husband about being in a cooking rut. This may be just the thing to get me out of it. They look delicious. This sounds absolutely delicious. I would love to make these beef tacos. Gotta look for Ling Ling rice at the store. These tacos sound fabulous! I’ll be making them for dinner soon. We love that Ling Ling rice! I absolutely love how easy this is to make. I am always trying to find creative recipes to do with my shredded pork and I think this would be a really good one. I have never tried the Ling Ling rice but they look so good and so easy. I will tell everyone about this taco recipe and the slow cooker method. I have been hearing a lot about this brand Ling Ling. I am going to give it a try. I love that it is versatile in adding to other foods as well. This is really neat, I never thought to make Japanese inspired shredded beef tacos before. I will give this recipe idea a try, tacos are always good! The ingredients you used to slow cook the beef would really give that distinct Asian flavor! I love how you made use of Ling Ling fried rice in a taco dish. This is something I will have to make for my family. It is going to be a winner for sure. I want to come eat at your house. You always have such great looking recipes. These tacos look so good and I need to try this rice. This will be the perfect was to mix up Taco Tuesday!! This looks like a loaded taco meal with the shredded beef. It also does look really tasty. 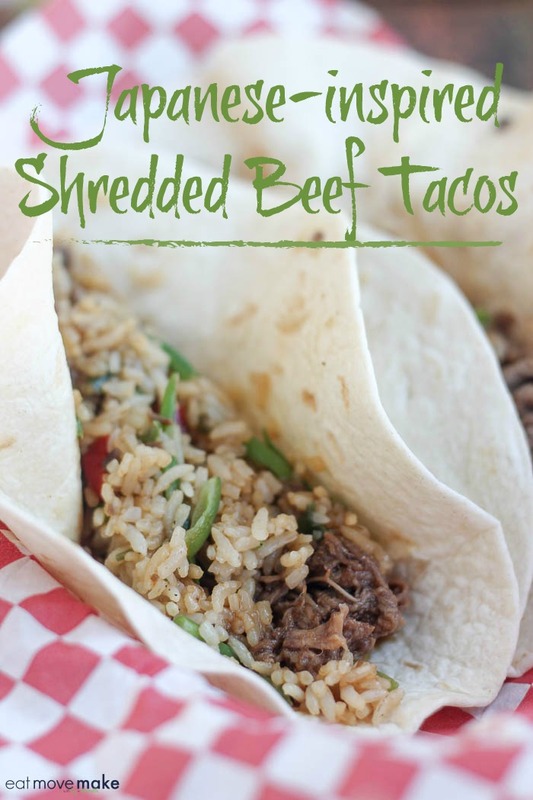 I love shredded beef tacos, and I love how you transformed them into something more. I love the Asian inspired dish you’ve created. I love fried rice too, and this is such an awesome recipe to make. Asian and Mexican fused together! Yum. These look super yummy and easy enough to replicate! Love the Japenese twist too. I love your Japanese spin on these delicious looking tacos! And I’m loving this new idea on how to use a chuck roast. Pot roast with potatoes and carrots gets boring after a while and I can’t wait to try your beef tacos! YES! This is going to save me so much time the next time we have tacos or fajitas! I love this semi-homemade approach, and Ling Ling is so good to begin with! Great! This is such a creative take on beef tacos! I love all that instant flavor you get from using Ling Ling, and I love the time that it saves, too! That is such a good idea! I’ve never thought about using this rice for anything other than a side. This is a super creative way to enjoy it. My family and I LOVE things tacos! I never would have thought to make a Japanese style beef taco. Yum! This is a dish that everyone in my family will like. Even my picky kids as they love tacos.